Alan Snow's novel Here Be Monsters! has proven to be a crowd pleaser, and with 2014's film adaptation it's proven its success in yet another field of entertainment. It's been adapted by Graham Annable and Anthony Stacchi, veterans of the animation department in Hollywood. Annable in particular has worked with Henry Sellick in the past, a man known to have mastered the art of stop motion animation. "The Boxtrolls" is a product of such mastery. It takes place in the ritzy, snobish, Victorian city of Cheesebridge. It's an aptly named town in which the class divide is indicated by the color of one's hat, and the amount of cheese on the dinner table. The rich, well off white hats have far more cheese than they could hope to eat, while the working class red hats are forced to split a small piece of cheese too small to appease even one small appetite. Living underneath the city is the forgotten 3rd rate community of trolls. Their only article of clothing is a cardboard box which they wear like turtle shells with which they hide in whenever humans are near. Each troll is named for the box they're adorned with (usually a type of grocery box). They're grey skinned, bald, with glowing yellow eyes, and big teeth, yet they're surprisingly more cute than scary. In fact, they're every bit as adorable as their CGI counterparts, Universal's other animated juggernaut, the minions (formerly of "Despicable Me," now their very own property). In fact, much like the minions, these boxtrolls have the sort of speech impediment that amounts to humorously garbled mumbling, that somehow ends up being fairly understandable anyway. 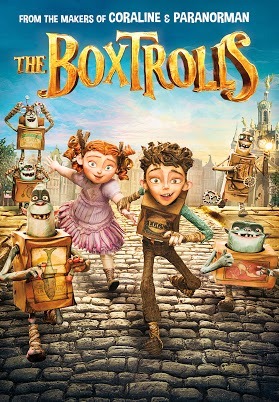 Nevertheless these boxtrolls are unwanted, misunderstood creatures of society. 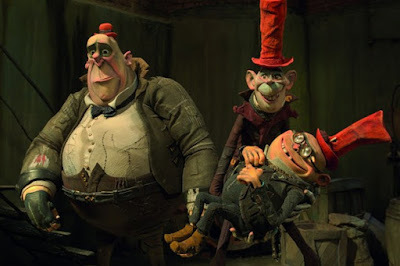 Much of their legend is due to supposed first hand accounts by supreme red hat Archibald Snatcher (Ben Kingsley), the aptly named manager of the only department in town responsible for the apprehension of said boxtrolls. His claim is that these trolls captured and killed a baby boy years ago, and are thus a menace to society. However, we know better. The baby boy is Eggs (Isaac Hempstead Wright), or at least he's now known as Eggs, named for his box clothing. His surrogate father in this underground community is known as Fish (Dee Bradley Baker), a boxtroll wearing a box with a fish on it. Up on the surface, they're hated by both white hats and red hats alike, and Archibald Snatcher sees these boxtrolls as a means of advancement in society. 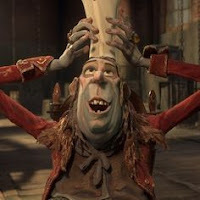 He works out a deal with head white hat Lord Portly-Rind (Jared Harris), that if he can catch and kill all the box trolls, he would receive his very own white hat and be accepted at all the fine cheese eating meetings. With the deal in place, the villainous red hat Snatcher sets about his devious plans, and quickly captures a large portion of the boxtroll community, including Eggs' father Fish. With more disappearances, including his own adoptive father's, Eggs heads up to the surface to figure out what's going on, and bring back his father if possible. Of course, soon after reaching the surface he's forced to struggle with the realization that he's not a boxtroll while being forced to cope with the circumstances that lead to his adoption by the trolls. Nevertheless, "Boxtrolls" never becomes a story about Eggs becoming human. Rather he's content to be who he is, and that is one of the essential messages here. 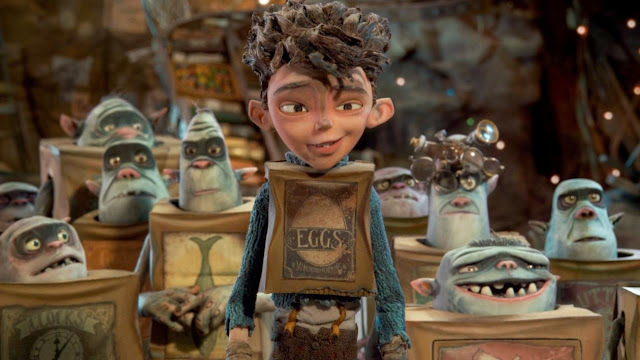 While trying to find Fish and the other boxtrolls, Eggs finds unexpected help in the form of Lord Portyly-Rind's morbidly curious daughter Winnie (Elle Fanning) who instructs him on how to interact with the members of high society. Yet much of the humor during the middle portion of the film involves Eggs' failed attempts to blend in with these white hats. Also serving as comic relief is Snatcher's hapless yet lovable henchmen Mr. Tout and Mr. Pickles, voiced by the hilarious duo of Nick Frost and Richard Ayoade (and the smaller evil henchman voiced by Tracy Morgan). They're very obviously, mistakenly on the wrong side of things as evidenced by their constant questioning of whether or not they're the "good guys." They do, however, find themselves working with the evil Snatcher. Snatcher is voiced brilliantly by Ben Kingsley. In fact, he's so good that you might not recognize the voice as his. Snatcher is obsessed with upgrading his status from that of a red hat to a white hat, and fancies himself a cheese connoisseur. In fact, in a humorous attempt to imitate the high society cheese meetings, he and his henchmen sit around a table sharing a tiny piece of cheese. The humorous irony of the situation is that he's allergic to cheese and thus his face puffs up to ridiculous proportions shortly after eating it. The main lesson for all of these crazy characters is to breakdown the class divide among other things. As such, the lesson, notably is for the adult characters of the film. Eggs himself does learn a few things along the way, but for the most part it's adults who need reforming. 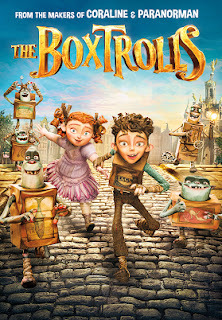 The boxtrolls themselves do, however, learn to stand up for themselves rather than hiding in their boxes when things get scary. Yet the film itself, is surprisingly not scary. Despite being by the same filmmakers that made "Coraline" and "ParaNorman," "Boxtrolls" never truly aspires to be as scary as those films. Make no mistake that is a compliment to "Boxtrolls," as it makes for a far friendlier family comedy affair fit for its intended audience, while still being entertaining enough for adults as well. This film tells an interesting enough story with a good sense of humor and a beautiful aesthetic. It's a pleasant surprise just how enjoyable this film is. In addition to the clever, humorous writing and strong vocal performances, it's a finely, intricately crafted world that they've created here. In particular the boxtroll's whimsical underground world is beautifully detailed. Most of their belongings are steampunk-esque machinery they've built and repurposed themselves from garbage thrown out by the wasteful red and white hats living on the surface. Even more incredible is the animation by Laika Entertainment (who have done such films as "Corpse Bride," "Coraline," and "ParaNorman"). I've always enjoyed stop motion animation. There's something more charming about this method of animation. There's a texture to it that makes the images far more tactile than traditional CGI. Yet it's also so surprisingly smooth and seamless that it could possibly be mistaken for CGI. If there was such a thing as the best of both worlds, it would probably look something like this.